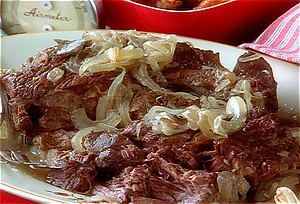 The wine and mushroom soup help to tenderize the meat and add wonderful flavor. Good to Go! Sprinkle roast on all sides with house seasoning. Using a skillet over high heat, sear roast until brown in oil. Place roast in a crock pot, and layer onio ns, bay leaves, crushed bouillon cubes, garlic, and cream of mushroom soup. Add the Chardonnay and cover with enough water to cover all of the ingredients. Cook on the low setting for 8 hours.